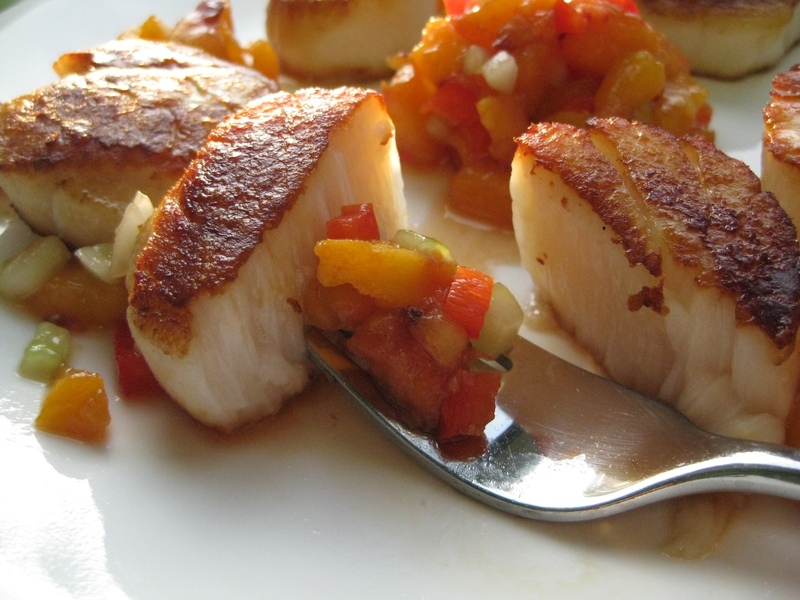 Plump sea scallops are seared to perfection and served with a fresh and juicy salsa starring peaches, red pepper and cooling cucumber in this quick summer entrée. The trick to getting a perfect sear every time with your scallops is to start with fresh ingredients and a very hot pan. If you’ve ever tried making scallops and had them stick to the bottom on the pan, it is probably because it wasn’t hot enough and they were flipped too soon. There is no need to rush here, these scallops will cook in less than 5 minutes. 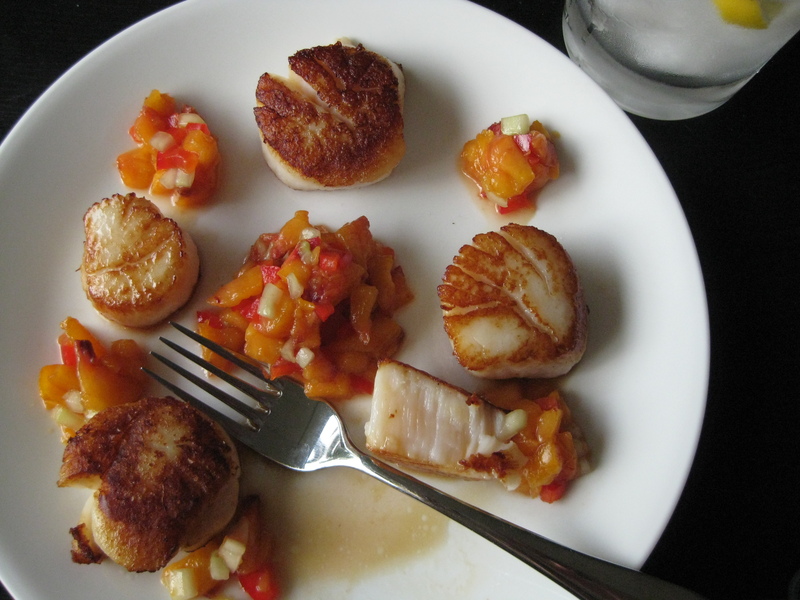 The fresh peach salsa is colorful and a perfect companion to these scallops, but you could also serve it with chicken or tilapia. My husband is allergic to shellfish, so the recipe below is for dinner for one. I’m sure you can easily double it for you and a friend. This is also a pretty impressive thing to whip up for a date, so boys and girls, take note! Peel and dice the peaches and cucumber, toss in a bowl and sprinkle with a pinch each of salt and sugar. Finely dice the red pepper and toss into the peaches. Squeeze the juice from one lemon wedge onto the peach mixture, toss to coat and set aside. In a large skillet, heat the oil over medium-high heat until it shimmers. Liberally salt the sea scallops, and place into the hot pan. Now don’t touch them!!! If you move them before that side sears, it will rip the scallop. Cook for about 2 minutes and 30 seconds, you will see the undersides begin to brown. Flip using a pair of tongs. Cook the other side for the same amount of time. 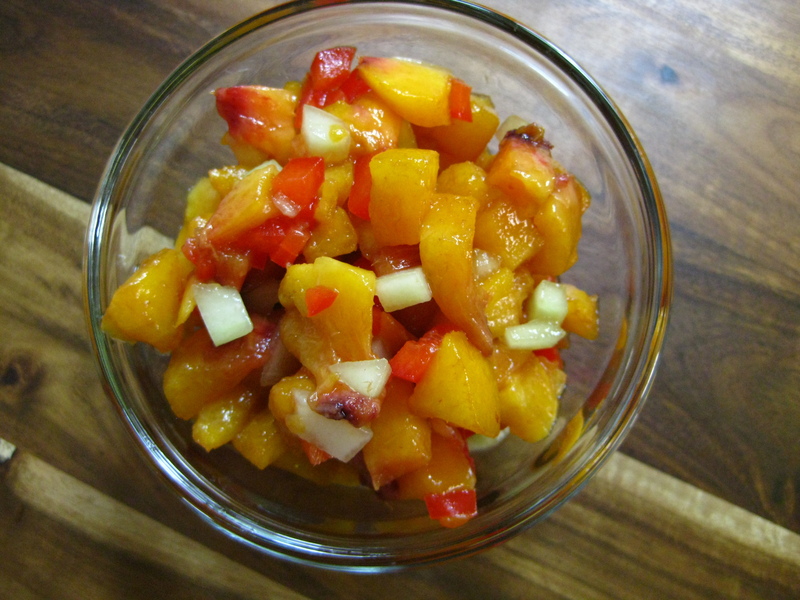 Immediately remove from the heat and plate with the peach salsa. If desired, squeeze the second lemon wedge onto the scallops. Daily Question: Do you have a go-to dinner for date nights? 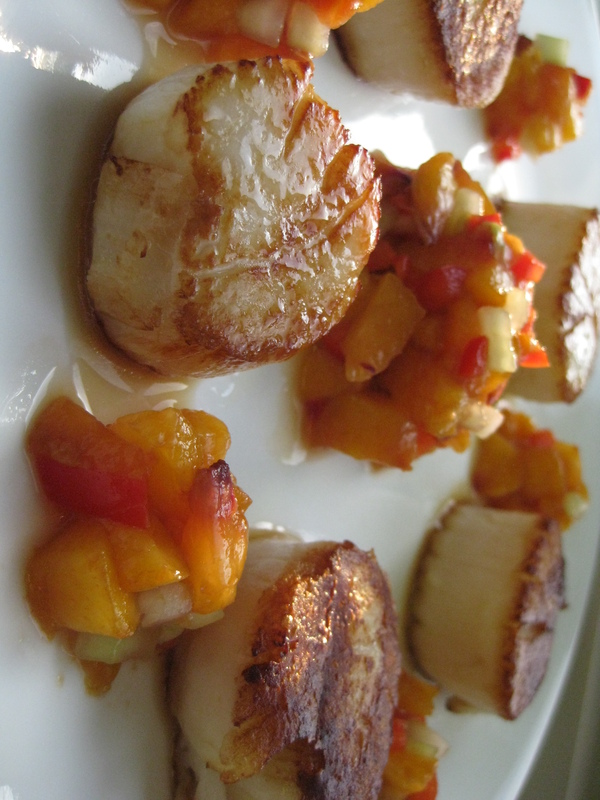 This entry was posted in dinner recipes, vegetarian and tagged cooking, dinner for one, fresh peach salsa, how to cook scallops, light dinner, meatless monday, romantic dinner, seafood. Bookmark the permalink. These look great. I seared scallops, I just posted a recipe on my blog. However yours sound better and perfect for summer. The peach salsa is so creative! Thanks, Russell. Your scallops look lovely, tarragon is the perfect combo! I’m very impressed with your dedication to food and your food photography. Keep following your passion and good luck in high school!